Yes! It’s February and we’re catching dorado! Normally, warm water fish, apparently, no one told the dorado as we keep running into them like this nice bull taken by our Washington amiga Carol Darby with Captain Gerardo. Another surprise this week! Wahoo once again showed up near Cerralvo Island like this speedy ‘hoo with Captain Archangel. 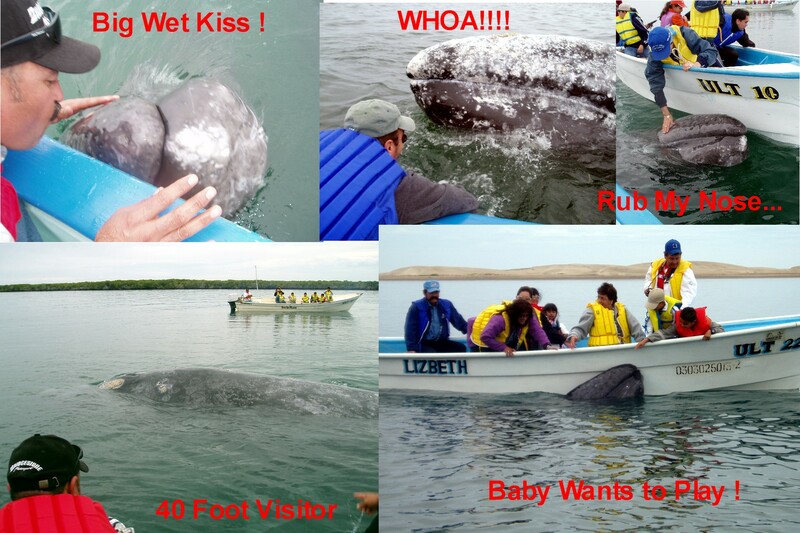 Apparently, this is turning into one of the best whale-watching seasons in recent years! 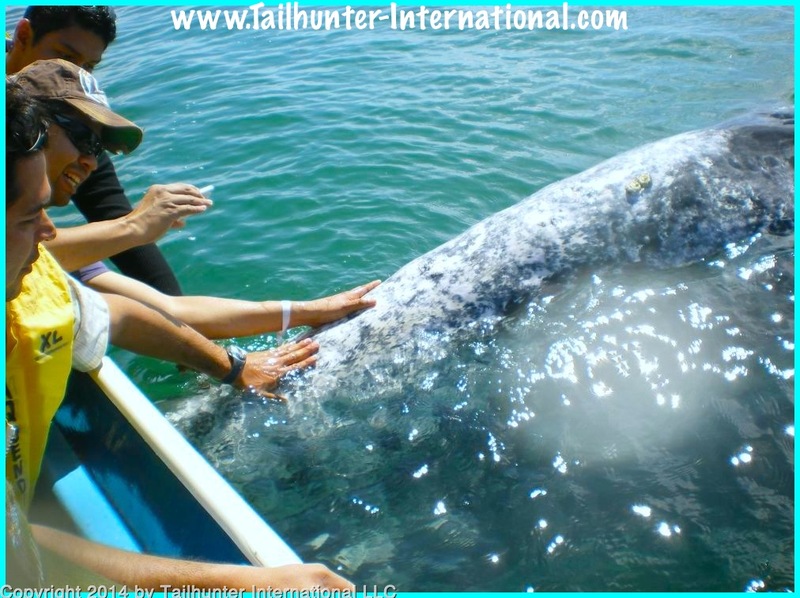 The whales are solid at Lopez Mateos at Bahia Magdalena and we’re running daily trips out to see them! Contact us for a trip of a lifetime getting close to these magnificent animals! Thanks, everyone who came to visit us at the University of Phoenix stadium in Phoenix, Arizona. We had another great time at the ISE show! We also booked lots of La Paz trips too! We’re filling fast! Now we move onto Boise, Idaho! See the details below and come see Jill and Jonathan! Generally, not a bad week of fishing for our anglers, but again, just like the last few weeks, some unusual catches. It’s almost getting to be an old record but the catches just don’t seem to make sense! 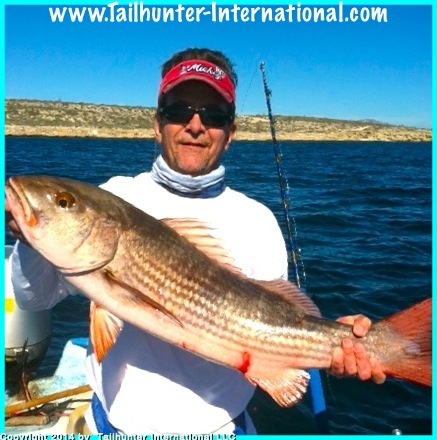 This is winter and catches are generally inshore and consist of inshore COLD water species. Well, the bite has certainly been inshore, but the CATCH has been rather unusual. For the past few weeks, and again this week, we caught dorado! Dorado are warm water fish. We catch them in the summer and fall when the waters are warm. What else is unusual is that the fish were mostly caught pretty close to shore…while fishing for WINTER fish like the cabrilla (sea bass) and sierra and species like that. We did indeed catch the sea bass, sierra, pargo and jack crevalle. But in the middle of that, it’s pretty surprising to also get dorado. Likewise, also got a few wahoo as well. So, go figure. 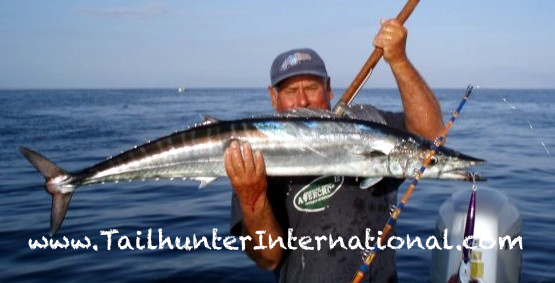 Again, the wahoo are usually trophy fish that we pursue in the warmer months! The wahoo ware taken off the north and south end of Cerralvo Island. We’ll just have to keep following this. All week, we’ve got a full week of fishermen so we’ll have a better idea of what’s going on with the bite. Hopefully, find more pargo and yellowtail too! TAILHUNTER TOUR MOVES ONTO BOISE, IDAHO! 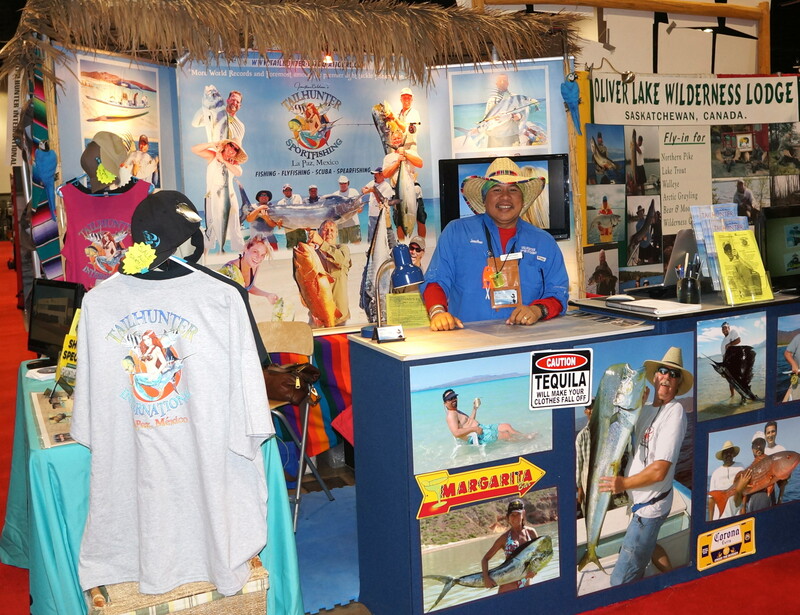 Come visit us at the Boise Sporstmans Show in Idaho this week. 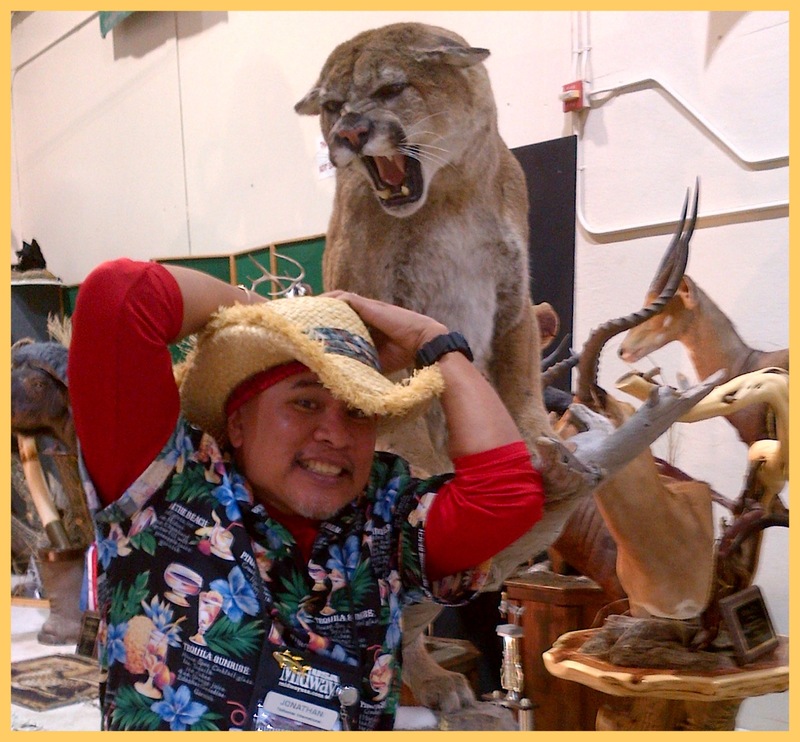 They have some great taxidermy displays there! Come visit us! There’s always alot to see and great fun for the family. 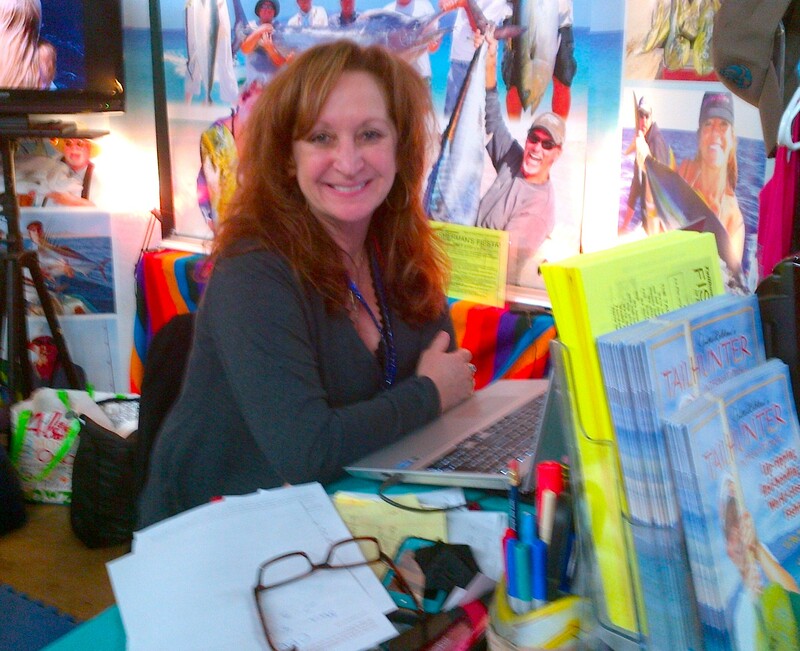 We’ve got new Tailhunter t-shirts and hats that Jilly designed plus come chat about your La Paz vacation this year! What the heck is going on? Wahoo in winter? Jack Steele originally from Seattle WA put this gorgeous ‘hoo on the boat fishing near Cerralvo Island late in the week. Check out the calm waters…it makes a difference! Fat forktail! Charlie “Sticks” McGee is one of the best fishermen I know and a dynamite drummer and music teacher as well from San Diego. 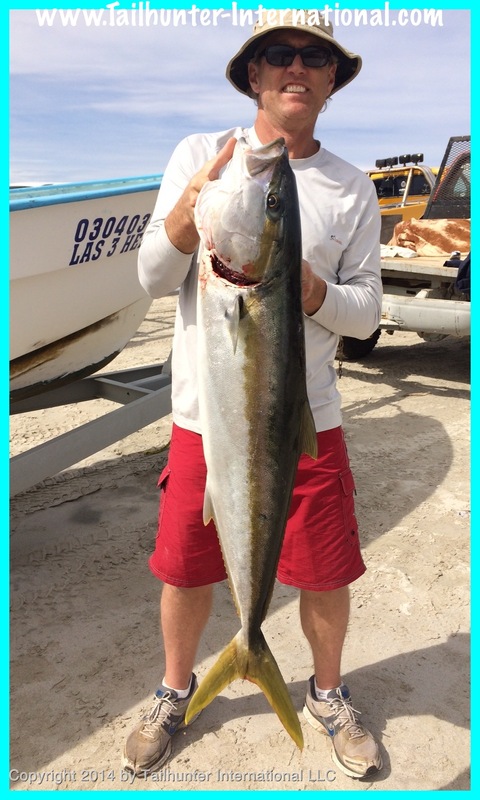 Our amigo stuck this thick yellowtail out in the channel north of La Paz. 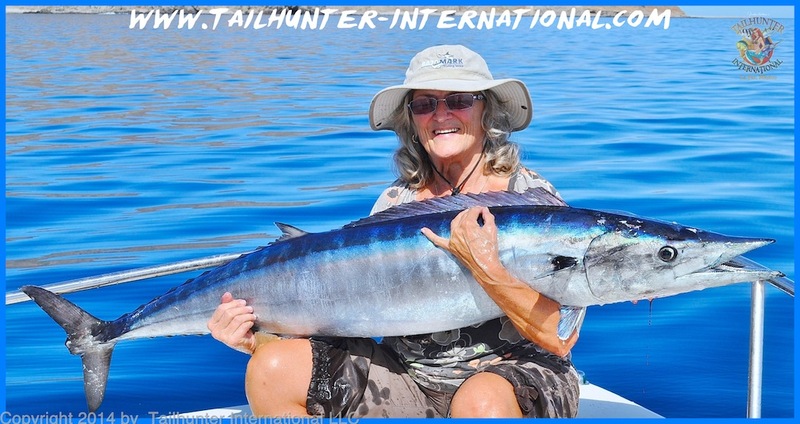 When it comes to putting big fish in the boat, our amiga, Donna Thompson, from La Ventana via Long Beach CA holds a thick, fat wahoo…a personal best! 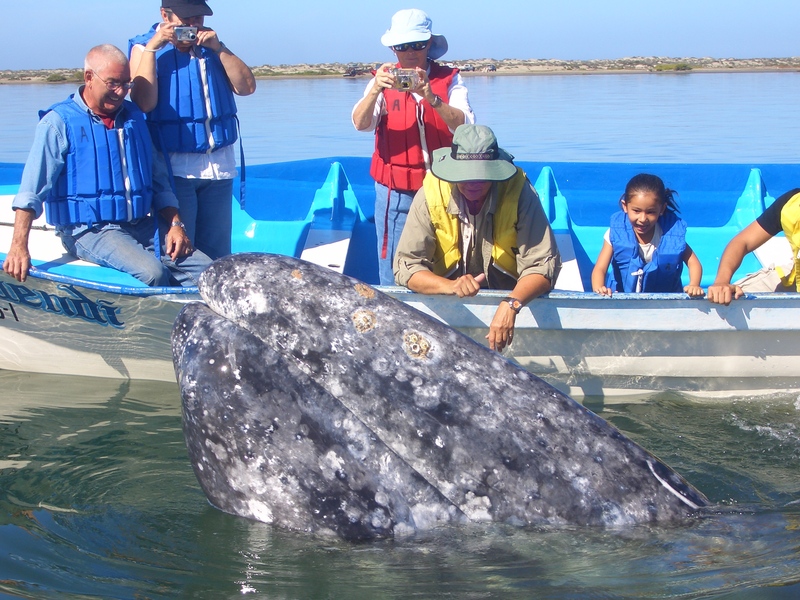 We’re smack in the middle of whale watching season and taking folks out daily to Bahia Magdalena to see the whales. 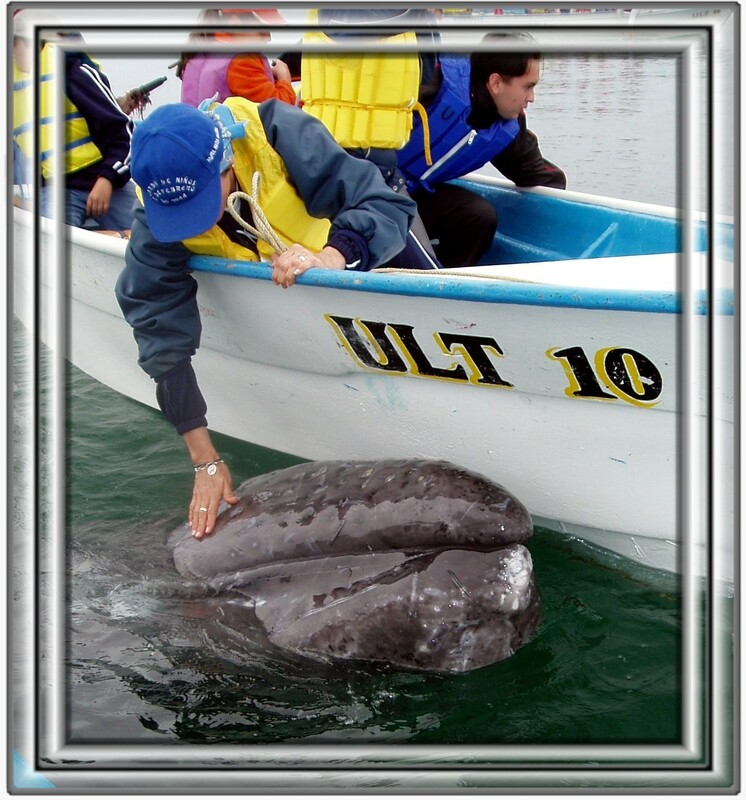 Contact us for a once-in-a-lifetime experience and get close to these great animals. They normally start to leave around March so don’t delay! 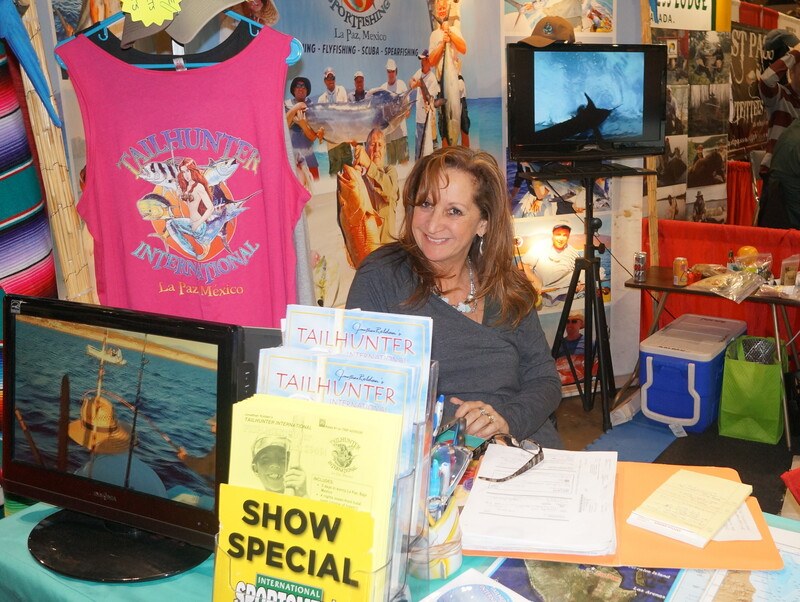 Tailhunters is finally leaving the Pacific Northwest where we have been for the last month doing some outstanding shows in Puyallup WA (Seattle), Portland OR and Yakima WA! Thanks to everyone who has come by…old friends and new amigos! 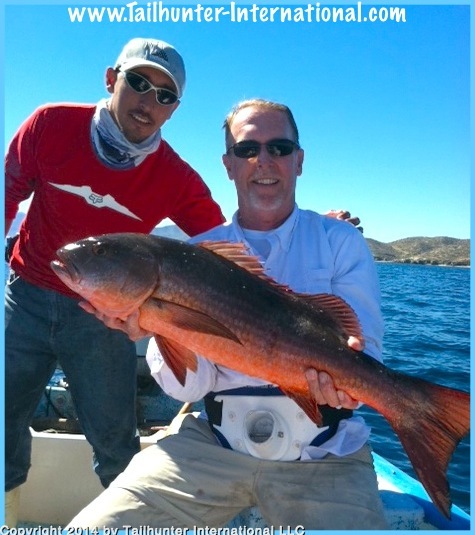 Lots of bookings for fishing with us in La Paz this year! But now, we leave the snow and rain and one of our favorite areas and head south all the way to the Phoenix ISE show where it’s supposed to be 80 degrees! Hope to see you there at the Cardinal football stadium! More details below! An otherwise slow week was saved by a late week chew that turned up some quality fish. As typical, we got the usual winds, especially early in the week. That never helps with the fishing but we come to expect that during the winter. Especially northern winds. It also really jacks up our ability to get live bait. But, as the week went on, the winds diminished. And suddenly the bite turned on. And it was a surprise. Usually, we look for inshore fish during winter. But instead, we got some real trophy stuff. Once again, just like last week, wahoo showed up around Cerralvo Island. Normally, it’s far too cold for us to be seeing these prized fish, but the boats took the at the north and south end of the island on slow trolled baits as well as lures. The fish were good quality too with fish going 20–50 pounds which are real slammers, especially when you consider that these are known to be the “fastest fish in the world” capable of blazing line off a reel at close to 70 mph! But, on top of that, we also picked off a few dorado. Again, not only are these warm water fish, but we shouldn’t even be seeing these until about later March or April. 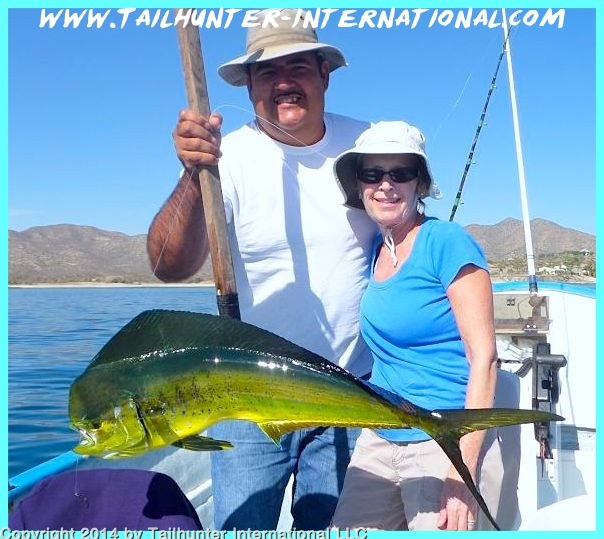 In addition to the wahoo and dorado, a few more of the yellowtail also bent the rods. These fish are more typical of this time of year and we should be going full bore on these any week now. So, it was encouraging to see more of these in the counts. As for other species, we took some small pargo and snapper, cabrilla, and lots of bonito. It’s been a great show season and Jill and Jonathan now leave the Pacific Northwest and the Yakima WA sportsmens show and head south to the Phoenix International Sportsmens Expo. Our next show starting this week will be in the Cardinal Football Stadium where the NFL Cardinals play! This is a super show! Lots of stuff for the whole family! Come say hi! Our 2014 Tailhunter Road Tour takes to the road again this week. 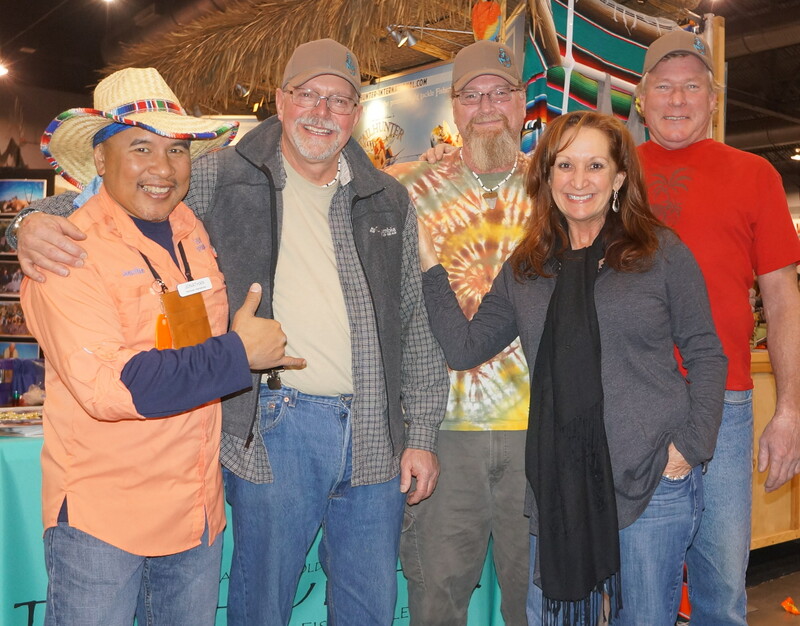 After an outstanding month in the Pacific Northwest attending shows in Washington and Oregon, we now drive south and take off our rain and snow gear and put on the shorts as we go to the International Sportsmans Expo in Phoenix, Arizona. This is really a super show right on the floor of the University of Phoenix Football stadium where the NFL Cardinals play! It’s a great place for a show and there’s always great weather, plenty of parking and lots to see! The dates are Thursday to Sunday (Feb. 20-23rd). We’ll see you this week! Horse buster! 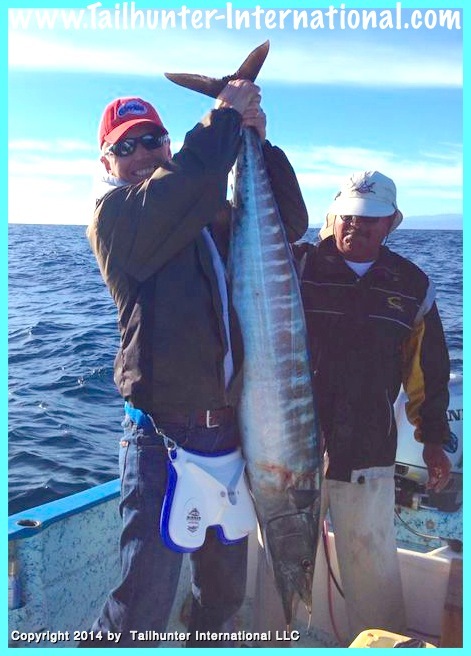 Carl Lange from Bakersfield CA fished 4 days this week ending the week by sticking some trophy pargo liso just off the rocks fishing with Captain Pancho. The big fish have moved into the shallows now for their spring spawn. 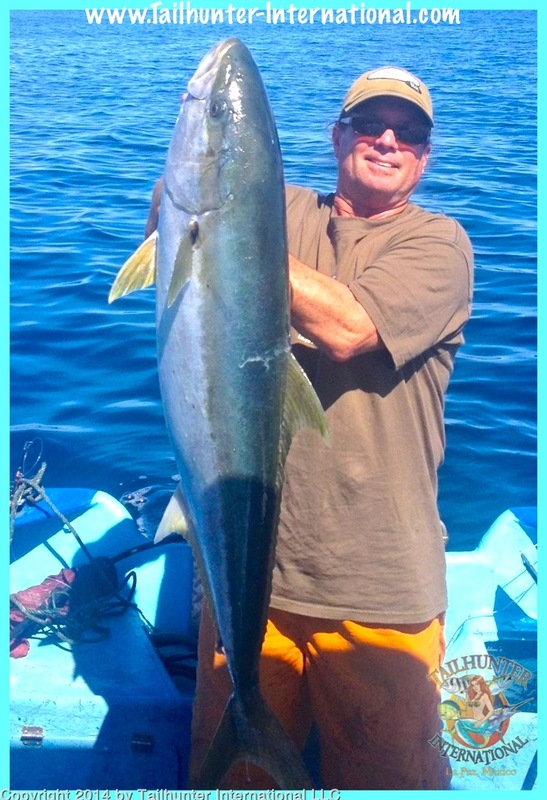 He fishes with us several times a year, but our amigo, Ken Gragg, found a way to save a tough week of fishing by catching some dorado, sierra, some bonito and also took home some nice pargo meat from big pargo they caught off Punta Perrico. 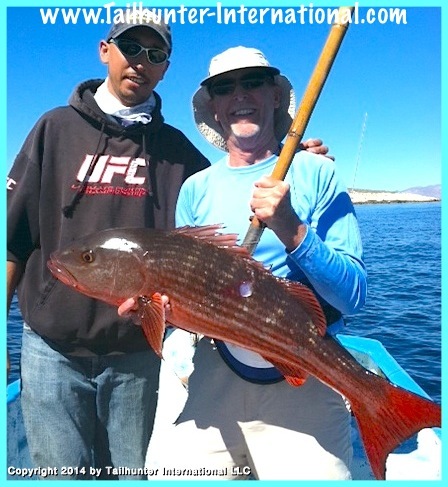 Carl Lange with another of his big red pargo (mullet snapper) and Captain Pancho happy to pose along! Yes! The whales are now here and we’re running daily tours to Bahia Magdalena to get close to these great animals in the calm bay waters. The whales usually stick around until March so check with us about coming to visit us to see the whales! Come say hi to us in Portland, Oregon at the Northwest Sportsmans Show this Wednesday to Sunday! Details below! The week started off in typical winter fashion with 80 degree sun, but quite a bit of wind making it bouncy and rough on the waters. The fishing reflected it as well. There were a few unseasonable dorado caught but beyond that, just a few sierra and bonito. A bit of action, but nothing to write home about. But that’s also why we don’t have many fishermen around during the winter. If you’re looking for some sunshine and some fishing action, you’ll be fine, but if you’re searching for flat waters and quality fish, it can be elusive. However, as the week went on the winds calmed and the seas flattened. Correspondingly, the fish bite improved. 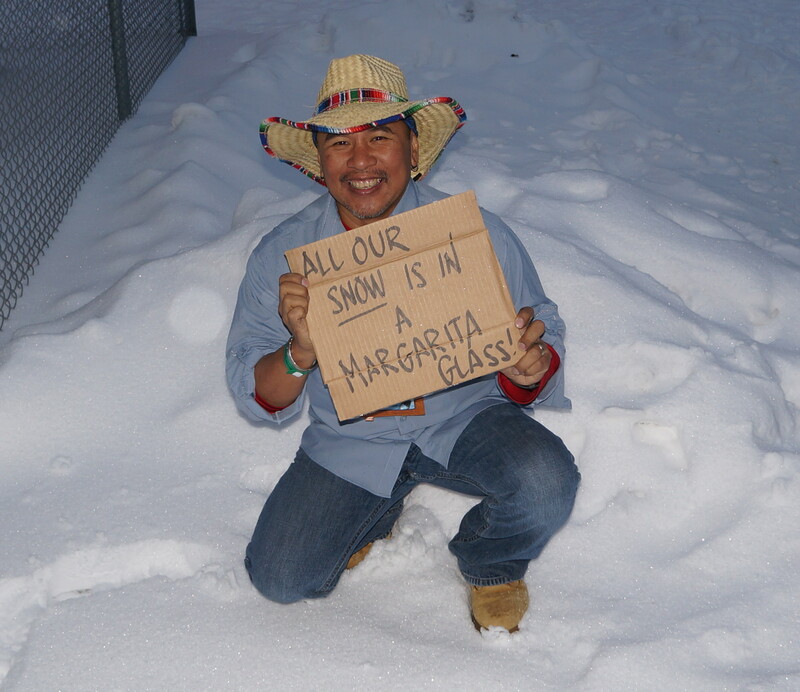 Our folks saw yellowtail, but couldn’t get anything to go. However, the big pargo have moved into the shallows to spawn. Those are always great…and often frustrating…sport! So hooking them is one aspect. Getting them to the boat is test of wills and good tackle! These fish hit like a train and go straight back down to the rocks Given it can only be a few feet deep, often you’re lost before you know it and so is the fish! If you don’t pull hard and turn their heads, they’ll rock you! We call these “zing powie” fish because that’s the sound your tight lines make before they sing and snap! 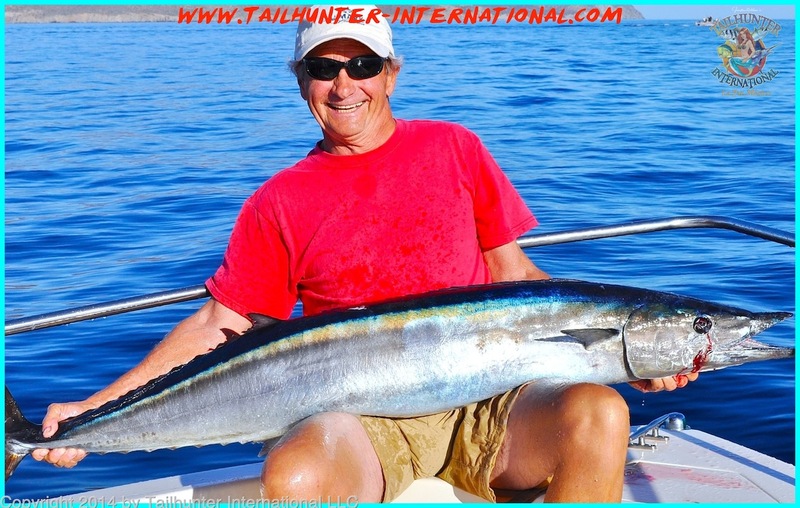 Pargo fishing is an entirely different dimension of fishing and can be great fun and frustration! 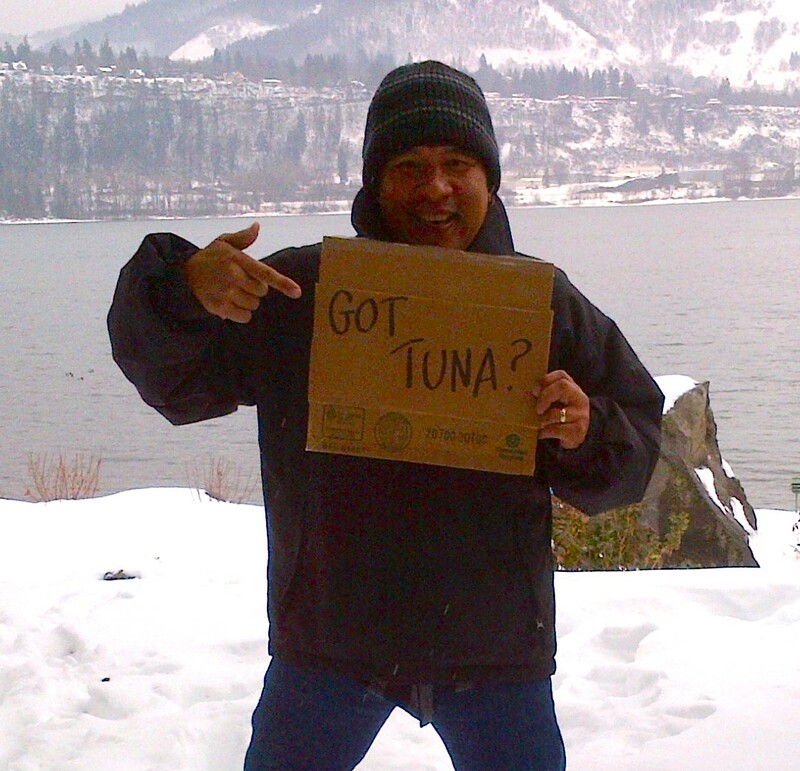 We have guys who specifically come each season to go hand-to-hand with these fish. Great eating too! 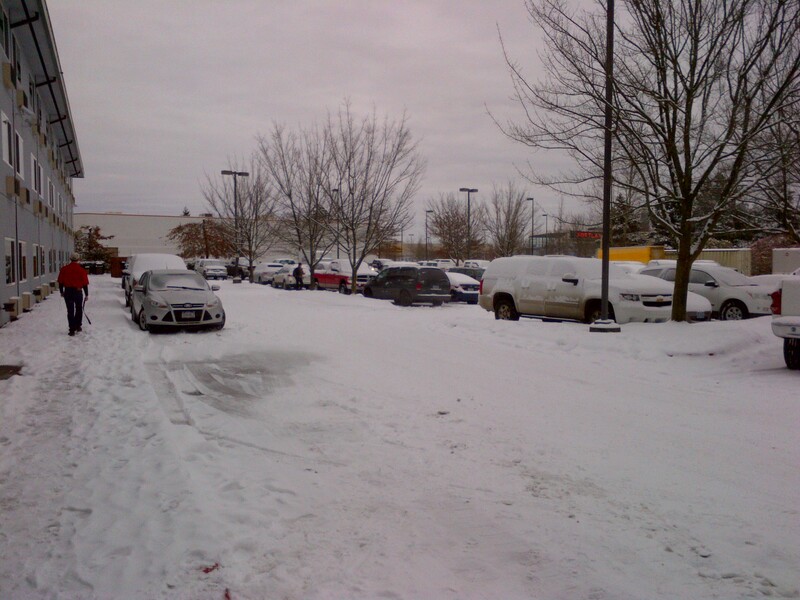 We’re now moving the Tailhunter Road Show and booth to the Portland Expo Center! We’ve been on the road now for a month. We’ve driven to super shows in Sacramento…then Denver…then Puyallup (Seattle/Tacoma)…and now we’re here in another of our favorite cities…PORTLAND! The city on the Columbia River and one of our largest shows of the tour. It’s a monster…it’s a beast…it’s grand fun for 5 days from Wednesday to Sunday…Feb. 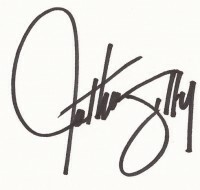 5-9…Portland Expo Center! Come say hi! 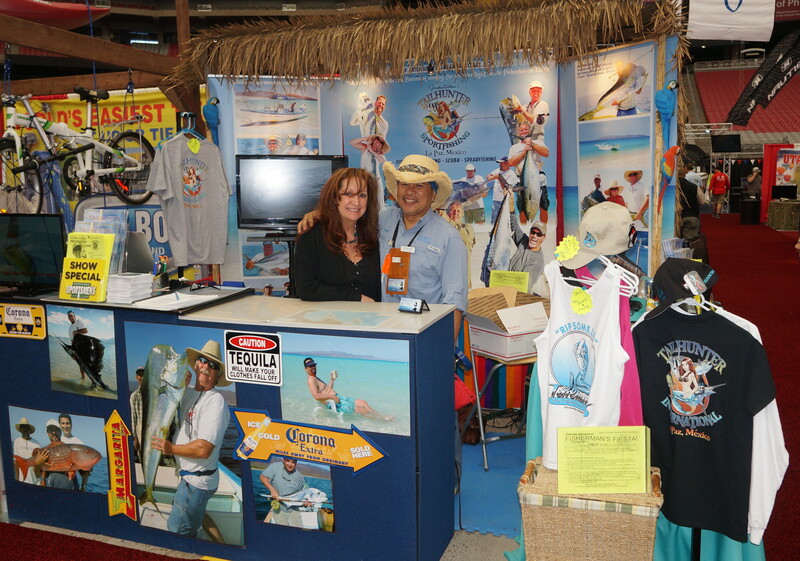 Talk to us about your 2014 La Paz trips and check out our new T-shirts, hats and our new 24-page 2014 brochure! We’ll see you this week!